Our aim is to equip Christians in the USA to share their joy of knowing Christ with Muslims. This mission is not thousands of miles away. There are at least 12 million, and possibly up to 20 million, Muslims who have made this country their home. 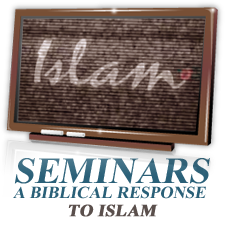 There are a lot of misunderstandings in both camps and our desire is to help and train Christians to be able to confidently approach Muslims with the true message of Christ. Personal and friendly relationships open the door for discussion about spiritual issues and personal beliefs. The foremost duty of Christians is to show Muslims the love of Christ. One need not have a PhD, not even be a high school graduate, or be an expert in evangelism to share the Gospel with Muslims. It is the availability that matters and it all starts with sharing the love of Christ. We believe that local churches and its members have the best opportunity to share the Gospel of Jesus.